The main purpose of this article is to discuss the raison d’être of the future Museum of Wadi Halfa. This museum aims not only to be a place to display objects but a rescue mechanism for intangible heritage of the Nubians living in the area. It aims to reconnect them through the valorisation of heritage, with the past from which they were cut by the construction of the High Dam of Aswan. This museum is thought to be the counter-part of the Nubia Museum of Aswan (Egypt) opened in 1997. UNESCO is involved in both museums as an actor of the Nubian heritage conservation since the 1950’s. The concept proposal prepared for this museum and discussed in the article should make the Wadi Halfa museum a dynamic institution and an integral part of the Wadi Halfa community linking its past and present for a better future. Le but de cet article est de présenter de la raison d’être du futur Musée de Wadi Halfa. Ce musée vise à être un lieu d’exposition d’objets, mais aussi un mécanisme de sauvetage du patrimoine immatériel nubien. À travers la mise en valeur de ce patrimoine, il s’agit de reconnecter les Nubiens vivant dans la région avec leur passé dont ils ont été coupés par la construction du Haut barrage d’Assouan. Ce musée est considéré comme la contrepartie du musée de la Nubie à Assouan (Égypte) inauguré en 1997. L’Unesco est associée à ces deux musées en tant qu’acteur de la conservation du patrimoine nubien depuis les années 1950. Le concept muséographique discuté dans cet article, devrait faire du Musée de Wadi Halfa une institution dynamique, partie intégrante de la vie de la communauté nubienne en reliant son passé et son présent pour un avenir meilleur. 1In 2005, the Sudanese and Egyptian authorities signed a memorandum of understanding for scientific cooperation in the field of cultural heritage including the construction of a museum in Wadi Halfa (Sudan). This museum is thought to be the counter-part of the Nubia Museum of Aswan (Egypt) opened in 1997. Both museums involve the UNESCO as an actor of the Nubian heritage conservation since the 1950’s. The main purpose of this article is to discuss the raison d’être of the future Museum of Wadi Halfa which aims not only to be a place to display objects but a rescue mechanism for intangible heritage of the Nubians living in the area and their reconnection, through the objects, with their past from which they were divorced by the construction of the High Dam of Aswan. 2Before discussing the concept of the museum, I will briefly outline the history of Wadi Halfa and its characteristics as a border city as it appears in the eyes of a “Sudanese” being so far away from the heart of the country. Sudan is one of the largest countries in Africa. The distances between the centre (Khartoum) and the peripheral areas are enormous – not only in terms of space but also in terms of traditions. Sudan is a ‘young’ country belonging to the post-colonial era and formed by several areas characterized by diverse geographic assets, ethnic groups, religions, languages and cultures. This diversity has made difficult the formation of a ‘Sudanese’ identity. The above introduction let us understand better the latest project of building a museum in Wadi Halfa, the city closely related to the construction of the Aswan Dam. Through the follow up of the International Campaign to Save the Monuments of Nubia held during the 1960’s, we will describe and analyse the proposal for the construction of a museum aiming to promote Nubian intangible heritage and reconnect that heritage with the tangible heritage of the Nile Second cataract area. 3Wadi Halfa is located in northern Sudan, on the east bank of the Nile a few miles south of the border with Egypt, only 70 km from the famous site of Abu Simbel. Like all big border cities it has always had a strategic function. It was through all its history the most important post on the Egyptian frontier as it was situated at the terminus of the navigation route from Aswan. Moreover it was situated at the end of a formidable cataract – the second one that made almost impossible the navigation. 1 These fortresses are Buhen, Mirgissa, Semna, Kumna. 3 Mubârak cAlî, History and Geography of Sudan (in Arabic), Cairo, 1903, p. 38. 5The modern town of Wadi Halfa was founded in the 19th century. The British during their occupation of the country made there their headquarters, while during the Second World War is a communication post of the allied forces. The British built a railway the construction of which started in 1877 during the time of General Gordon,2 in order to facilitate their activities in the country. Wadi Halfa was certainly the most important town between the first and second cataracts, with all the administrative offices, schools, a mosque and an important market representing the core of the city.3 The modern Nile Hotel, architecturally, was definitely the most appealing building of the city (fig.1). 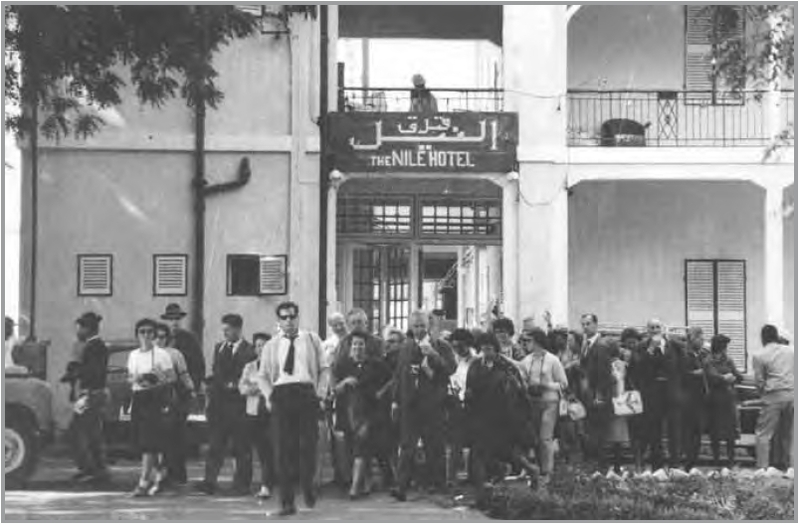 Its rooms housed the visitors, rich traders, administrators but also tourists who came to Wadi Halfa in the winter as well as the well-known international personalities, in particular academics during the Salvage Campaign before the destruction of the city in 1963. Although the strip of cultivable land was limited, it was very fertile and rich in palm trees. The famous “Palm-Date Avenue” shaded with two rows of thick date palms was also the first of its kind in the country. 5 Wenzel M., House Decoration in Nubia, London, Gerald Duckworth & Company, 1972. 6 Dafalla H., op.cit., p. 66. 9The above quotation clearly confirms that Nubia appears as a very distinct region from the centre in terms of culture and traditions. Moreover, the archaeological remains of the ancient civilization scattered all over the area were sources of pride for the people living beside them. Thus, the construction of the High Dam raised the awareness among Nubians that the loosing of their monuments could cause something more dangerous than to loss of a simple building of mud; their identity was eventually threatened. 12However, if the campaign was successful in saving the great Egyptian temples, most of the cemeteries, settlements, churches, mosques, or fortresses could only be documented but not saved. Only moveable objects from these monuments are available, therefore museums play an important role to restitute the archaeological context of the region. 14Nowadays, the new town of Wadi Halfa consists of the people who refused to move from their land in 1963 and an important community of people coming from Southern Sudan. The historical train that continues to carry, in endless travels, thousands of people, snaking through the desert from Khartoum to Wadi Halfa, is still unchanged over time. The ferry, which once a week is still shuttling from Aswan, continues to represent the strongest relationship with Egypt. While an aircraft, which muscles between the dunes of the desert where there is a very simple airport is the fastest link with Khartoum once a week. 13 Marino G., De Simone C., Nubia Submerged, Cairo, Agenzia Italiana, 2000. 15In this context, the UNESCO and the Sudanese authorities decided to built a Museum. One would argue that the construction of a museum is secondary in a place where many basic infrastructures such as good roads, electrification, and water supply are missing. But Nubians today, especially those who for development reasons have been displaced, argue they need to save their cultural identity in danger of disappearing in the context of new places where they live. It is only by reconnecting with their past, they can save their future. In the same vein, the Italian Ambassador Francesco Aloisi de Larderel in its introduction to the book Nubia Submerged (2000) writes: “Roots of our past are important for our identity: people who have no memory have no future”.13 In such a context, the creation of the Wadi Halfa museum appears as a basic developmental tool. 16The museum, as it will be discussed below, will also help to develop a range of activities that will hopefully create the conditions not only to bring many displaced Nubians at home but also visitors. The development of eco-sustainable tourism in the area will not only ensures the maintenance of the museum but will also speed up the processes to create missing services and improve those already existing. 17In 1981, the International Campaign to Save to Monuments of Nubia ended up after the inauguration of the Philae temples. UNESCO organized in Paris a meeting to discuss with the Egyptian and Sudanese authorities the follow up to the campaign. The Sudanese authorities did not attend for internal political reasons and this marked the end of the activities related to Sudan in the frame of the Campaign. The Egyptian authorities, instead, decided in cooperation with UNESCO to launch the International Campaign for the Establishment of the Nubia Museum of Aswan and the National Museum of Egyptian Civilization in Cairo. The construction of the Nubia Museum in Aswan, which began in 1985, was regarded as the symbol of the follow up to the Campaign and to a certain extent, an achievement for all those Nubians forced to leave their land of origin. “to give […] an overall picture of a region that not only has its own, well defined cultural patterns and rich heritage… but has also been in modern times deeply transformed due to the construction of the Aswan High Dam, and has been the scenario of an international archaeological campaign […]”. 14 EAO-UNESCO report, November 1982. 15 Nubia Museum, Architectural and Exhibition Program, EAO-UNESCO, November 1982. 20If the construction of the Nubia Museum of Aswan was actually an acknowledgment for the Nubian culture, at least in Egypt, on the other hand it overshadowed the possibility of having the Museum in Wadi Halfa. 21This situation lasted until the Executive Committee that administrates the International Campaign for the Nubia Museum of Aswan and the National Museum of Egyptian Civilization in Cairo, in its fourteen meeting in 2004 voted a recommendation for a Joint Egyptian-Sudanese Mission to Nubia to assess archaeological sites and museums of the area.16 The mission terminated with the signature of a Memorandum of Understanding between Egypt and Sudan which recommends the creation of the Wadi Halfa Museum.17 This mission represents the reopening of a window on Sudan after the termination of the Salvage Campaign. 22As a UNESCO expert part of the mission and as a specialist in Nubia, the author of this article personally stressed the importance of the creation of this museum. The target of the mission was to individuate cultural emergencies (endangered archaeological sites, museums needing improvement) in the area to be considered for possible support. 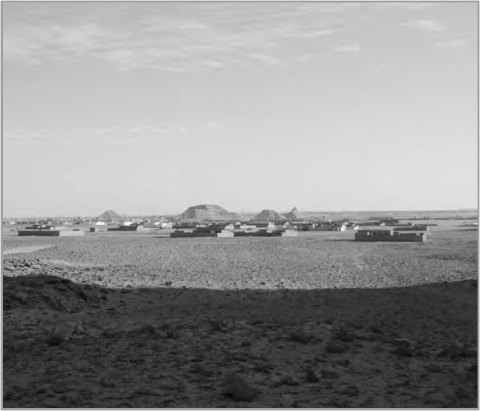 Although many emergencies were identified,18 the most urgent was considered the establishment of the Wadi Halfa Museum, taking into consideration not only the cultural but in particular the human dimension of the emergency. During the Nubia Campaign in fact a lot of attention was paid to monuments, it is time now to look also to the preservation of the cultural living through the construction of a museum. 19 De Simone C., Wadi Halfa Development and Museum Concept Proposal, UNESCO Report, 2007.
to connect it with its millennial past of which it is a direct continuation. 24This dual function has to be put into practice in an appropriate manner. This will avoid as it happened that despite all the good intentions the museum ends up being only a place of commemoration of the past without any specific link with the present. The museum will be a community-based museum. An “interactive Nubian village”: a sort of eco-museum, which has a holistic approach emphasizing the importance of the whole and the interdependence of all its parts. The culture of Nubia from Prehistory to the Islamic period. Thus it will compensate, through artefacts, the gaps of the Nubia Museum of Aswan in particular regarding the cultures developed south of the second cataract. It will highlight the role of Wadi Halfa as a border city in particular through the events of the 19th century when the modern city submerged then by the Lake, was founded. It will present in a separated area the history of the International Salvage Campaign which in Sudan is the history of Wadi Halfa, included the resettlement of the people. One of the main attractions of Nubia during the millennia were its gold mines located in the Eastern Desert and exploited until the Middle Ages. Archaeological research carried out in the area led to the discovery of extraordinary testimonies. A space must be devoted to temporary exhibitions. The systematic organization of temporary exhibitions is very important to create events and keep alive the cultural dimension of the place and in the same time attract more visitors. 27As mentioned above, an interactive Nubian village in local mud brick, whose houses will be used for the display, reviving and protection of the intangible heritage of the area will be created. What is represented in diorama in the ethnographic section at the Nubia Museum of Aswan here must be shown alive. 28The construction of the High Dam has seriously endangered the traditions of the modern Nubians following their resettlement in alien areas. For such this reason, activities aiming to keep alive what runs the risk to be lost forever should be planned. In such a context the Museum of Wadi Halfa should compensate the mostly archaeological character of the Nubia Museum of Aswan, emphasizing the intangible heritage of the Nubians. A handicrafts centre where members of the old generations, who are cultivated on these traditional arts and their associated folklore can transmit their skill to the new generations who are cultivated on these traditional arts and their associated folklore. This will not only provide an income-generating activity but will improve also basic literacy. A small centre for teaching and practice of the Nubian language will be vital to the preservation of what is considered to be the symbol of the modern Nubians. The new generation of Nubians transplanted elsewhere speaks almost exclusively in Arabic. It is thought that in less than twenty years appropriate measures are not taken, Nubian language will completely disappear. Along with the preservation of language it is also important to preserve and transmit to new generations also the literature of modern Nubia, and in particular that of the novelists. Though some of these novels are written in Arabic language, their content opens a window on the life of the modern Nubians. A centre for musicology will serve not only to preserve the music and the Nubian language through the songs, but will also keep alive the atmosphere in the village. Special musical events will be organized on a regular basis and perhaps institutionalized on a fixed day to become events that may attract more visitors. The visitors targeted are both locals and tourists. Since everything in this interactive village should aim at preserving the contemporary Nubians traditions, one of the houses will serve as a restaurant-bar where traditional food and drinks will be served. To label all the area not only in Arabic and English but also in Nubian will not only serve to mark better the character of the museum but will get both locals and visitor familiar with this language. 32The Wadi Halfa Museum will represent the core of the Nubian area in Sudanese territory, a scientific and cultural propulsive centre for the region between the Second and the Third cataract of the Nile, rich in important archaeological sites and beautiful Nubian villages. 33Obviously, tourism is an essential factor for the maintenance of the museum. The problem of Wadi Halfa Museum is not the building itself, but the design of its future cultural and tourism raison d’être, so that it may be sustainable, successful and will attract visitors from Egypt. Considered in a holistic vision of Nubia, Wadi Halfa is situated in a remarkably strategic position, being located in the heart of the Nubia area and only 70 km south from one of the most visited archaeological sites in the world: Abu Simbel. A specific tour to “Nubia”, with trained guides, starting from Aswan and continuing through the sites of the Lake Nasser culminating at Wadi Halfa or continuing further south, could offer a more deep and clear view of the history of Nubia. But also to attract the large number of tourists visiting Abu Simbel daily to visit Wadi Halfa with a two-days visa extension to Sudan will be very important for the maintenance of the Museum. 34The development of this northern part of the Nubian region will give a great impulse to the economy of this entire borderline spot. The cooperation with the Nubian Egyptian sites will be very important especially with Abu Simbel, only 50 km north, and with the twin Nubia Museum in Aswan. This kind of cooperation will offer the opportunity to organize scientific events (exhibition, seminaries, training courses, etc.) and also tourist activities creating new tourist routes in the whole area of Nubia. The multiplication of offering to the sightseers will create a circulation of tourism in all the area, involving both the Sudanese and Egyptian Nubia. 35Wadi Halfa can also be the entry point of exciting expeditions to the Eastern or Nubian Desert with its interesting gold mines archaeological remains. These remains which testify to the intensive activity conducted in the area in a long span of time, were the main attraction of the neighbouring of Pharaohs as is testified by the numerous hieroglyphic inscriptions left. 36Beside the archaeological remain the area offer also possible meetings with the local Beja with their particular and unique traditions.23 Wadi Halfa is the departure point of the famous Wadi Halfa-Khartoum historic railway that crosses the most barren part of the Eastern desert and has the potential to become a real tourism symbol for Sudan. Possible tourist routes can be organized from here also to the Western desert in particular to the nearby Selima oasis. 37The difficulties to cross the border with Egypt, apart the weekly ferry which connect directly Wadi Halfa with Aswan, is a current reality. Once the projected museum and related activities will become a reality, specific agreements may be reached. And then, the sustainable development of Wadi Halfa can become a potential source of funds for the Sudanese authorities, to be used for the maintenance of archaeological sites in the area as well as for that of other museums in the country. To this end, the creation of a tourism focal point for the registration of routes in the area is worth creating. It must offer multimedia products on the visited sites and well trained tourist guides. 38The concept proposal discussed above should make the Wadi Halfa museum a dynamic institution, and an integral element of the Wadi Halfa community by linking its past and its present for a better future. 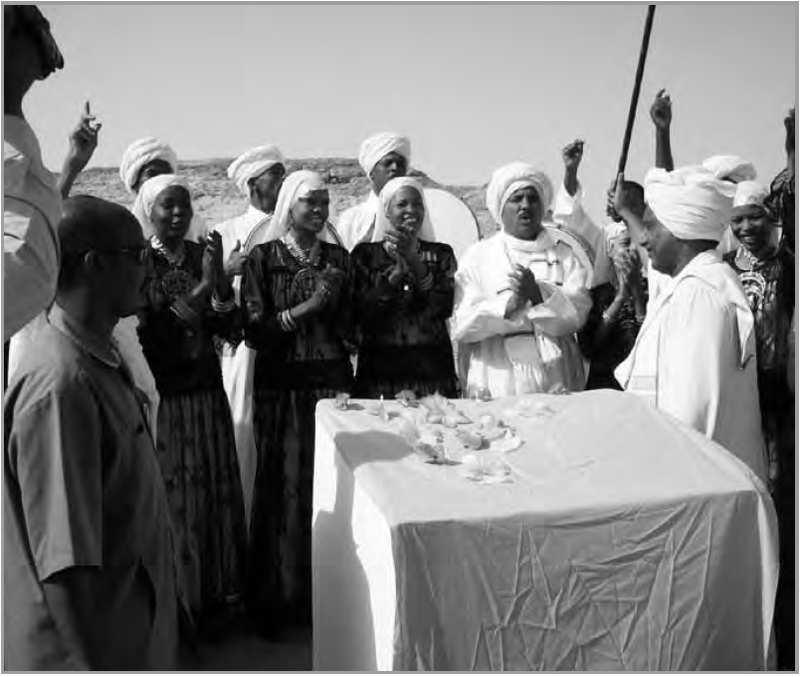 Currently the design of the museum is ongoing while its foundation stone has been posed on 22nd of April 2008 during a ceremony which did not only celebrate the event but also represented an important step forward in the integration of Nubians from both part of the border (fig 3.) The doors of the Nubia Museum in Aswan have taken twelve years before opening to the public. We hope it will take a shorter time to open those of the Wadi Halfa museum which have already been closed for too long. 2 Barakat D., The Egyptian Sudan and the Interests of the British Policy, London, Oxford University Press, 1959. 4 Traders from Syrian and Egyptian origin were living in the market northern area. At the east, the Arkawit quarter was occupied by Elegait, Kenuz and families of Egyptian origin, while Kenuz families and non-Nubian Sudanese workers used to live in the Tippets quarter. Egyptians who migrated from Upper Egypt for better condition of life and settled here adopting Sudanese nationality without forgetting their traditions of Egyptian fellah occupied the Basalawa quarter. In the Gebel district, a community of black people coming from the Nuba Mountains of Kordofan was living. The only district to be inhabited by only Nubians and with Nubian characteristics was the Dabarosa one. Described by Dafalla H., The Nubian Exodus, Khartoum University Press, Khartoum, 1975, p. 15-19. Personal communications by elders of the Wadi Halfa Community. 7 The reservoir is called Lake Nasser in Egypt and Lake Nubia in Sudan. It covers a 500 km: 360 km in Egypt and 140 km in Sudan. 8 6th of April 1959: President of Egypt Gamal Abdel Nasser launched his appeal to UNESCO. The same appeal was launched on 24 October of the same year by Ziad Arbab Minister of Higher Education in Sudan. Säve-Söderbergh, Torgny, Temples and Tombs of Ancient Egypt, London, Thames & Hudson, UNESCO, 1987. 12 Fernea R., Nubians in Egypt, Cairo, Social Research Center of the American University in Cairo, 1973. Though this survey was limited to the Egyptian Nubia, it can considered valid also for the Sudanese part. In the frame of the project for the creation of Wadi Halfa Museum, an Ethnological Survey on the Nubian communi-ties of Wadi Halfa is currently ongoing. It is executed by UNESCO Cairo Office and implemented by the Nubian Language Society in Khartoum. Most of the members of this Society are from Wadi Halfa. 16 The Aga Khan Award for Architecture, 2001- The Eight Cycle, 1999-2001: Nubia Museum, Aswan, Egypt. Aga Khan Development Network, July 3, 2002. http://www. akdn.org. 17 UNESCO Joint Egyptian-Sudanese Mission to Nubia, Unpublished Report,UNESCO, February 2005. The target of the mission was an assessment of museums and archaeological sites of the area between Khartoum and Aswan to be considered for possible support. At the end of the mission several project proposal were elabo-rated both at the UNESCO HQ and Cairo office. De Simone C., Mohamed Salah el Dine, Mohamed el Biali, “The Preservation of the Site of Nuri”, in Proceedings of the Second International Conference on the Archaeology of the Fourth Nile Cataract,in Meroitica 23, Wiesbaden, 2007; De Simone C., “Activities in favor of the preser- vation of Nubia Heritage at the UNESCO Cairo Office”, Paper presented to the 11th International Conference on Nubian Studies, Warsaw, August 27- September 2, 2006 (in press). De Simone C., “Preservation of the archaeological site of Nuri”, paper presented to the 11th International Conference for Meroitic Studies, Vienna, 1st September 2008 (in press). 18 De Simone C., A Memorandum of Understanding between Egypt and Sudan in the field of Cultural Heritage, paper presented to the 10thInternational Conference ofEgyptologists, 22-29 May 2008, Rhodes, Greece (in press). 20 In Varese (Italy), at the “Depandance” of Villa Tosplitz, the Castiglioni brothers, two Italian ethnologists who have been, exploring the Eastern Desert for several years, have created a museum-room with some posters and findings from the area. 21 Abdel Wareth Abdel Meguid O., “The Nubia Museum and Community”, Museum International, 225-226, May 2005, p. 67-72. 22 Kirshenblatt-Gimblett B., “To preserve also the practitioners – Intangible Heritage as Metacultural Production”, Museum International, UNESCO, 221-222, May 2004, p. 52-65. 23 Briggs J., Sharp J., Springuel I., Belal A., Bedouins by the Lake: Environment, Change, and Sustainability in Southern Egypt, Cairo, American University in CairoPress, 2009. Costanza de Simone is an Egyptologist specialised in Nubian Studies. She has been working as a UNESCO expert for several years.